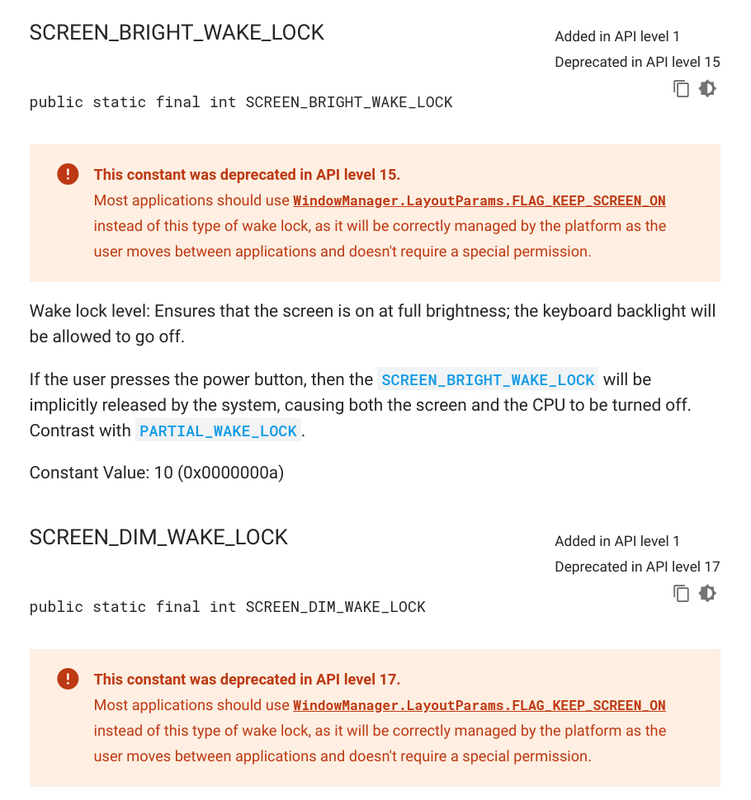 Brightness wake lock is deprecated in Android. You are supposed to use FLAG_KEEP_SCREEN_ON. Counting manually, my Pixel screen stays on for 30 seconds, then dims and stays dimmed for 10 seconds then turns off. Something like that. I think the conclusion is that we should not have a special "brightness" wake lock, but add some info in the spec that UAs should not dim while the lock is held. That could be non-nominative as well, if we want to be really flexible. Next message: Kenneth Rohde Christiansen via GitHub: "Re: [wake-lock] Need maximum screen brightness mode (#129)"
Previous message: Kenneth Rohde Christiansen via GitHub: "Closed: [wake-lock] API to get list of active wake locks (#133)"
Next in thread: Kenneth Rohde Christiansen via GitHub: "Re: [wake-lock] Need maximum screen brightness mode (#129)"
Maybe reply: Kenneth Rohde Christiansen via GitHub: "Re: [wake-lock] Need maximum screen brightness mode (#129)"